Mansfield boss Steve Evans claimed his side were the dominant force for the entire 90 minutes during their 2-2 draw with Luton yesterday. The Stags clearly had the better of the first half against a below par Town, going 1-0 up through Rhys Bennett’s strike, before Hatters came out much improved in the second period. Lee Angol added to the hosts advantage with 19 minutes left, netting from a counter attack goal that had come against the run of play, but there could be very few who left the ground thinking the Stags had it all their own way, with Luton clearly bossing the second 45 in terms of possession and territory, with goals from James Collins and Danny Hylton salvaging a point. However, Evans clearly saw it differently, saying: “I was wholly satisfied with all of it apart from two or three minutes where they got two goals. “Second half we were just so dominant, first half we were dominant, second half we were even more so. “We got the second goal and it looks as if it could be three or four, we had to make changes as people were running out of energy, but the changes didn’t really affect it. “We’re the bitterly disappointed team, they’re telling everyone they’re going to win the league, good luck to them and I think with that performance they’ll see that we’ll be there as well. “We played some fantastic football in spells, we're 2-0 up and we're cruising, they get a goal from a counter attack which can happen and then Mal Benning doesn’t do his job. 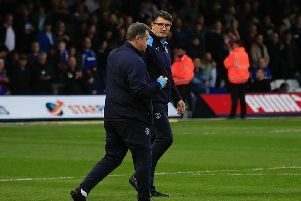 However, Town boss Nathan Jones had the exact opposite view to his counterpart, as on his side’s second half efforts, after switching to a 3-5-2 formation, saying: “We discussed it about how we were going to cause them problems because at the time they were better than us in times of man for man. “But we started very well second half and then we decided to change. It was a good change in the end as it gave us a real foothold in the game and we created a lot more playing that shape, so it was a good result. Evans, who had his customary running battle with referee Ross Joyce throughout the 90 minutes from the sidelines, also claimed he felt Town should have ended the game without their full complement of players on the pitch.